All New Wolverine is a comic book series from American publisher Marvel Comics. It focuses on a character named Laura Kinney, who is a clone of Marvel’s evergreen clawed mutant hero property, Wolverine. The two have what is in essence a father/daughter relationship, which was touched upon in our review of Generations: Wolverine & All-New Wolverine). With Wolverine currently dead, and replaced in most comics by a time-displaced alternate reality version known as Old Man Logan, Laura has since taken on the Wolverine code name. All New Wolverine #28 follows Laura and her adoptive extended family. These characters consists of individuals who were part of, or at least connected to, a clandestine government operation called the Weapon X project. Weapon X was, in essence, to do with militarising super-powered mutants. 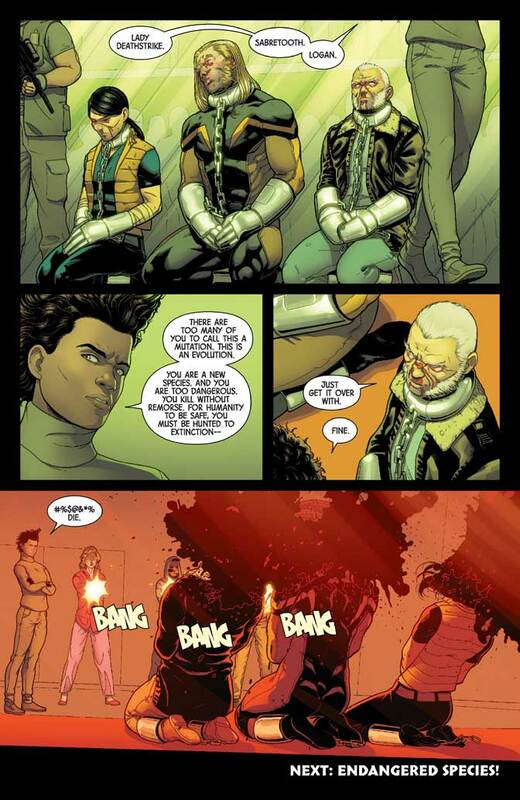 This includes Wolverine’s biological son Daken and a child named Gabby. Aside from their connection to the Weapon X project, Laura’s group all share similar superhuman abilities, with the most notable being an accelerated ability to heal, even from the most ghastly of wounds, a key element of the Wolverine franchise. Laura’s associates are on the run from a group called the Orphans of X. This consists of the loved ones of individuals who were assassinated by the living weapons created by the Weapon X program. Apparently, these surviving relatives have banded together, amassed resources and formed a paramilitary group bent on getting revenge against any one who was ever part of the Weapon X program. Hunting down and killing individuals who are bred to be near-unkillable assassins is impossible for the average person. What makes this bloody pogrom feasible is the Muramasa blade. It can cut and pierce through even adamantium (the metal used to coat Wolverine’s bones) and arrests the target’s healing abilities on the molecular level. The Orphans of X have turned the Muramasa blade into bullets. The issue is refreshingly fast-paced. It is self-contained to a degree: a reader who is familiar with the franchise will be caught up after the first few pages, even without reading the preceding issues. There is an action scene in which Laura’s group is ambushed, with Daken sustaining a potentially fatal injury, by the Orphans of X. The issue also introduces a way for the Wolverine offshoots to counteract the effects of the Muramasa steel bullets. The breakneck pace is somewhat softened by the comedic antics of Gabby, which surprisingly manages to serve her purpose as comic relief accentuating by contrast the otherwise grim and desperate tone of the comic. Australian writer Tom Taylor does a great job with All New Wolverine #28, as he crafts an action-packed issue with small bits of humorous banter, before teasing a shocking plot development towards the end. And he does this without being burdened too much by the property’s lengthy, convoluted history.